Here I am! Shooting the videos at McCormick Studios was so fun! Chef Mark Garcia was really nice and energetic, so that helped a lot. Doing all of the takes was fun because we messed up a lot and had some major bloopers. On one scene, I dropped the cup holding the onions into the pan on the stove. I burned my wrist while I grabbed it out the pan! OUCH! Well, I hope you like my video better than my bloopers. So what did you think of my video?? 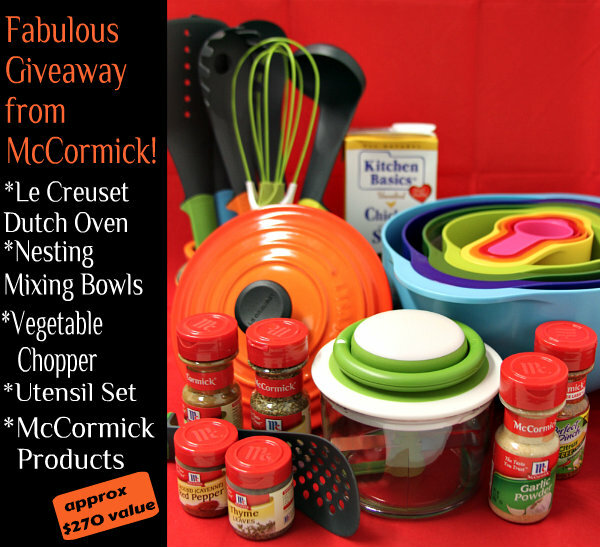 McCormick is offering this cool giveaway! This giveaway is now closed! 1. Tweet the giveaway with a link. Leave a separate comment letting me know you tweeted! 2. Share the giveaway with a link on your facebook page. Leave a separate comment letting me know you shared! 3. Pin the recipe (or giveaway) on your Pinterest page. Leave a separate comment letting me know you pinned! The giveaway is open until Tuesday, November 6th at 8PM PST. The giveaway is only open to USA residents. Be sure a valid email address is included with your comment(s). Winner will be chosen via random.org and announced on this post. I will email the winner and if the winner doesn’t respond in 48 hours, a new winner will be chosen. The giveaway kit will be shipped by McCormick. Good luck! GIVEAWAY IS NOW CLOSED. Winner is randomly selected #174: Diania- thanks so much for entering! P.S. Sometimes the comments won’t post right away. I have to approve most comments, and I’m busy during the day… so don’t worry if your comment doesn’t show up right away- it will eventually! 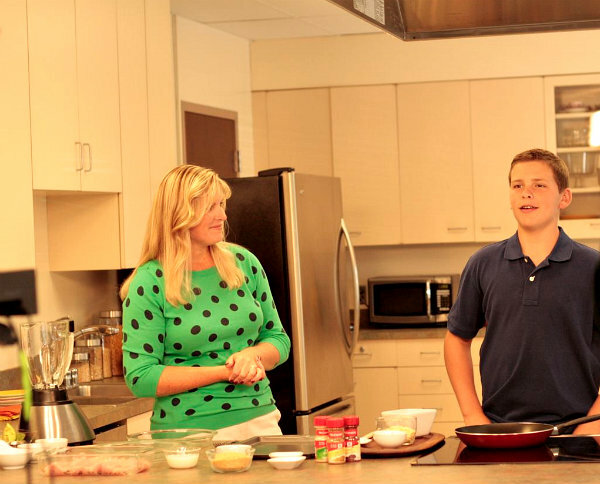 A yummy recipe that my Mom and I created for McCormick Spice Company! 1. Preheat the oven to 425 degrees F. Spray 15 X 10 X 1-inch baking pan with no stick cooking spray. 2. In a low, wide bowl add milk. In a second low, wide bowl- mix the tortilla crumbs with the chili powder, cumin and garlic powder. 3. Dip the turkey cutlets first in the milk and then in the spiced tortilla crumbs. Place on the baking sheet. Bake 15 to 20 minutes, or until cutlets are cooked through. 4. While cutlets are baking, prepare the relish. Heat a medium, nonstick skillet over medium-heat. Add the peppers, corn and onions. Cook, stirring, 3 to 4 minutes, until the vegetables are softened. Remove from heat. 5. Prepare the sauce: Add all sauce ingredients to a blender or food processor and process until smooth. 6. Divide turkey cutlets between four plates. Add a dollop of avocado sauce and a generous spoonful of corn and pepper relish. *This recipe can also be made with chicken cutlets. I have a salsa recipe that I only McCormick spices with. It’s so quick and easy. Tweeted about the recipe and giveaway. I make LOTS with mccormick spices, but I guess my favorite would be guacamole! I love to make chili or fajitas. Anything that I get to use a variety to change it up every time! I mix several McCormick spices together to make my own taco seasoning…that’s my favorite. I love to make Chili! Pinned the yummy recipe too! Spice cake! 🙂 I make a great one with a layer of in-season fruit on the bottom, yum. I use McCormick spices a lot, but I guess I use it the most for chili and taco seasoning. McCormick is my go to brand for homemade chili. Love McCormick spices ! I use it with everything ! Chicken, beef , fish ! Baking too ! I use McCormick spices for several things that I make…I use the chili powder and especially all the wonderful spices used for pumpkin dishes such as nutmeg, cloves etc. Southwest cooking is my favorite style. Chili, burritos, tacos, and braised pork roast! I always use McCormick spices to add flavor to my pasta sauces! i want to use the spices to make a vegetarian chili! I like to use McCormick spices for grilled chicken and to season ground turkey for tacos. I make my famous fried chicken and seasoned fries with McCormick spices! I love putting lots of their spices in my chili! McCormick spices are the best. I use them when cooking meats. They really bring out the flavor in them. YUM!! I love to use the spices in chili or when simply cooking chicken or steak. I mix different McCormick seasonings together to create my own taco seasoning. Mmm-mmm! I shared this on my FB page (Megan Harmeyer)! McCormick spices are dated & fresh — my choice for all my recipes! Oh my goodness! Goodness is right! I use McComick seasonings in everything, from dinners, eggs, baking, you name it!Even simmering sachets!!! It is the only freshest brand I have found. I love to make Turkey Tacos with their seasonings! Everything! McCormick is my number one brand of spices I use! I repinned the giveaway on Pinterest. I love to spice up chili, too! I love the chili seasoning packet when I make chili, and I ALWAYS have a supply of McCormick garlic powder and onion powder that is my “go to” seasonings for almost everything! The only spices I buy are McCormick! They flavor everything from chicken to steaks, to soups and I have even used the Mediterranean spice mix in a Greek salad! I like to use McCormick spices for chili, spaghetti sauce, and lots of slow cooker recipes. I also love McCormick spices for baking. I use McCormick to make my taco seasoning and use it on tacos and chili. I make anything and everything with McCormick spices… baking, cooking, chili, cookies, cakes, cinnamon rolls, you name it! I shared your giveaway on Pinterest! I use McCormick Lemon Pepper seasoning on fish. I love to make burritos with your cumin! I love using McCormick spices for just about everything….on the menu tonight, spicy chicken burrito bowls! YUM! Love making oatmeal cookies with their wonderful spices! I use their spices in many of my recipes, but I especially like to use them when baking fresh bread! I like using McCormick Spices in a stir fry or fajitas! I can’t wait to try this Turkey receipe. Bonus if I win a gift too! To make chili! Or curry! 🙂 I need more spices. I use McCormick spices in EVERYTHING I make, from baking to cooking, they’re the best available! Pinned the giveaway! Can’t wait to try the recipe! Lasagna! I use oregano, basil, and garlic powder…yum! I love the pepper grinders! I use McCormick to spice up cake mix for pumpkin spice cupcakes. I pinned the recipe on my “What’s for dinner” board. I added this to my Pintrest page. I shared the link on my facebook page. McCormick Rotisserie Chicken seasoning is my go to seasoning for almost any chicken recipe. Love it! I would absolutely LOVE to make a roast chicken lots of veggies! Great giveaway, thank you for opportunity! I would love to make chili with it! I tweeted! @littleislandstu (if you need the link, let me know) Thank you! I pinned this! And I really am crossing my fingers and toes that I win! My pinterest username is esm1128! I love to bake with McCormick spices! Super simple – I like to toss chopped sweet potatoes with olive oil and McCormick Cajun Seasoning. Roast for 30 minutes. I do not make chili without McCormick’s Mild Chili seasoning packet! Hungry Redhead repined your post! My favorite seasoning is cinnamon. From French toast to cinnamon and sugar toast I use it the most. I use them on everything!! LOVE them!!! 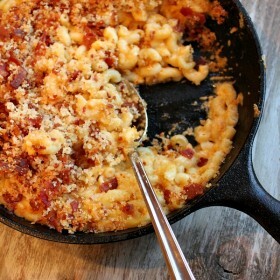 I love making everything with McCormick spices..from baked goods to savory foods. Their spices are the best hands down. My Gram’s Seasoned Pretzels – And let me tell you, McCormick’s Garlic Pepper is not always the easiest to find. But well worth it when I do! I ove to make spiced ginger cookies this time of year! I use McCormick spices to make a mean salsa and spicy chili. I tweeted and pinned. My favorite item to make is Chili, but I McCormick spices are in pretty much everything I make. I pinned your recipe! Looks delicious. I like using McCormick spices for Mexican rice, tacos and refried beans(cumin, chili powder). I like to make beef stew. I love making Pizza Stromboli with the spices. Thanks for the chance to enter. I like to bake with McCormick Spices — cookies and cakes, oh my! I tweeted, FB’d and Pinned too!! I love making chili with McCormick spices! I love making homemade taco seasoning! I love to season my chicken with McCormick spices! I would like to create a really hearty stew perfect for the winter! We LOVE making homemade veggie chili with McCormick’s spices! 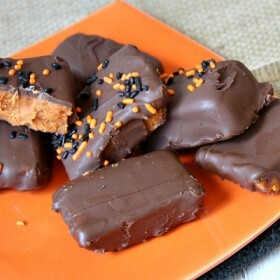 And chocolate chip pumpkin bars! I like using them in my marinades for flank steak or in my chicken chili! I like using the spices to make my own tomato sauce, for pasta and pizza! McCormick spices and seasonings go in EVERYTHING I make from soups, stews, and sauces to meats and even desserts!!! I like to make sweet potato pie with McCormick’s pumpin pie spice! I pinned this post on Pinterest! I love to make chili with McCormick spices! I love making Soups and Stews with McCormick spices. I liked and shared this post on Facebook. I use McComick spices in chili! 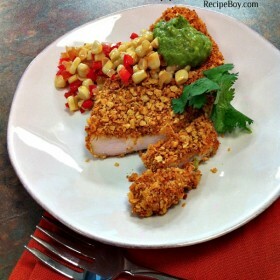 I would love to make fish or turkey tacos with the McCormick spices! Or even some sort of taco-inspired soup for the winter! I love using McCormick spices to make homemade taco seasoning. I love baking cakes using McCormick spices! I pinned it on my pinterest! I shared the link on my facebook! I plan to make every dish on my own this thanksgiving, I’ll need as much help that I can get. I use McCormick spices for my Texas chili, my cajun dishes, and my mexican dishes too! Hard to pick just one recipe….but I’ll pick the one i use more than just one McCormick spice in. That would be my hubby and I Thanksgiving stuffing! I like to add different spices to our main dishes and veggies,a variety of pies, and our beef roast for stews and pot roast. I use McCormick spices in my pumpkin bread! The majority of the spices I have are from McCormick, but I need a refill on many of them 🙂 Right now I would say my favorite thing to make is anything pumpkin. I like to use McCormick spices to make quesadillas! I LOVE baking cooking using McCormick Spices! I share the giveaway on my Facebook page. Anything with ginger. I love gingersnaps. I love using them in my scrambled eggs. I want to make this turkey with McCormick spices! I love the smell of sage when I add it to my Thanksgiving stuffing recipe! I like to make my own seasoning blends using McCormick spices. Taco seasoning, Cajun and Greek seasonings. Also, marinades. Pulled Pork sandwiches – the rub uses a lot of yummy herbs & spices. Lately I’ve been spicing up my tomato soup with onion, garlic and cumin. Really perks it up! Posted giveaway and your cool blog to FB. Tweeted, but don’t have a big following. Sorry! All my cooking and baking are with McCormick! What McCormick spices don’t I use! I probably use the garlic powder the most in my pasta dishes, chicken, homemade pizza. I love using McCormick herbs and spices so that I can add flavor without using much salt to my recipes. Great giveaway! I’d love to make a spicy chicken alfredo meal with some McCormick spices! Yum! Thanks for the opportunity. I love McCormick spices because of their consistant quality and affordablity. Also, my grandma and mom have always used them and taught me to cook with them. Applewood Rub on pork loin, in the crockpot, with sliced apples. YUM! I think we use McCormick spices in our house just about everyday. Chili and Spaghetti are the favorites. Pumpkin Bars, Fresh Apple Cake, just to name a few. I’d love to use the spices in breakfast dishes like oatmeal! Make a healthy and tasty meatloaf! I love to use my McCormick Spices to make homemade spaghetti sauce. McCormick is usually the go to spice in the grocery store, so what don’t I make with them? 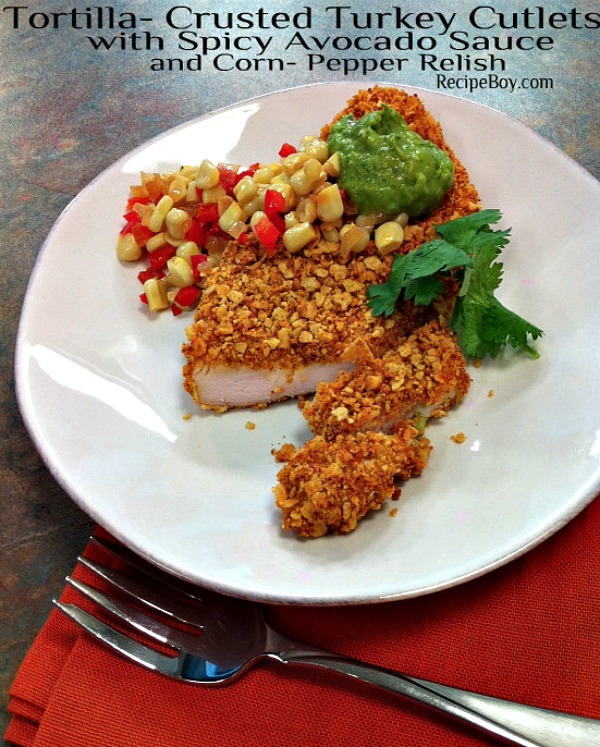 One of my favorite dishes, though is mexican chicken roja, made with chili powder… Mmmmm. I just pinned the giveaway on Pinterest! I like to make McCormick spices (nutmeg, ginger, cinnamon) to make pumpkin muffins! I made a slow cooker chicken tikka masala today that wouldn’t have been possible without all of my McCormick spices! love using spices to bake! gingerbread, apple pie, pumpkin-anything! I love adding spices to meat while cooking dinner! Spice cake would be great! thanks!! I like to make a spicy rub for chicken using salt, pepper, cumin, paprika, cayenne pepper and garlic powder. I also pinned the recipe to Pinterest! I use a lot of McCormick’s seasoning. It looked so yummy and a quick weeknight meal. Maybe I can get my son to help too. I love to use McCormick in meatloaf, mashed potatoes, and this season especially… in pumpkin pie (and now I’m hungry for a delish meal at 9:30am!). And I also pinned it for all of my friends to see – I love that your recipes are “easy” for a novice cook like me, and they are things that my kids like to eat (or will at least try). I make Chicken and Dumplings with the poultry seasoning. I have a drawer full of all their seasonongs though. Great giveaway! I love using their seasonings for homemade pizzas. I love to use McCormick Pumpkin Pie Spice YUM!! Oooh, great giveaway! I like to make pumpkin spice cheesecake with McCormick spices. Mmmm! I love using their seasonings for dressings and pumpkin pies….it’s that time of year! I love their Southwestern spice. Add it to omelets, soups, burgers, etc. I love making cheese tortellini with a bit of olive oil and then covered in spices – thyme, garlic powder, oregano, chives…the list goes on and on! Recipe Boy – you are too cute. I love your enthusiasm in the kitchen. My favorite way to use McCormick spices is in something like a pumpkin pie where I can break out jars and jars of spices at once – cinnamon, nutmeg, ginger, allspice, cloves, etc. The more the merrier. I love to make my homemade chili with McCormick spices! I also love that I can use those same, fresh, spices to make my pies and cakes as well. So versatile! I love using all their spices in carrot cake. I just posted about it (with a link) on Facebook! Roasted herb chicken & potatoes! I like to use the McCormick BBQ blend. I use it as a rub on chuck roasts,and slow cook it to make shredded BBQ Beef sandwiches. I make Argentine empanadas and always use McCormick spices to make them so flavorful! Yum. I want some right now. McCormick spices make great chili! Yum! I like to make chili with McCormick spices. I love using the McCormick Lemon Pepper seasoning on salmon. It’s also great on roasted veggies as a side dish! I use McCormick spices for most things…but I love the California style garlic powder. Put that with some melted butter and cheese and you have perfect garlic bread. Yum! I use McCormick Spices in a spice rub that I use for chicken breast for my chicken fajitas which is my go to dish and a big crowd pleaser. I’m not sure I’d like everything on it but the chicken sounds good!